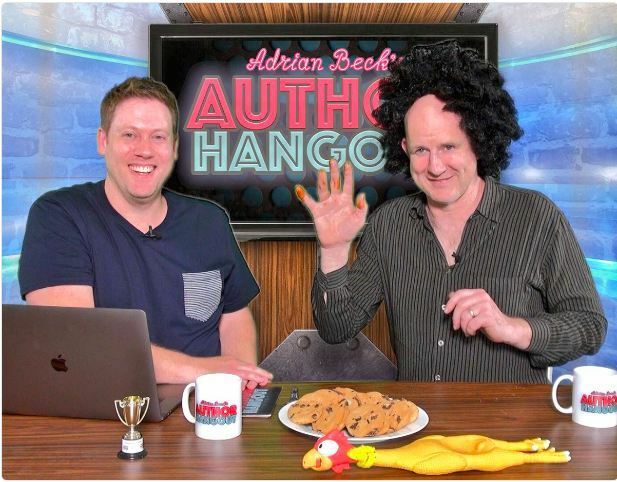 If you are interested in finding out more about some of your favourite authors, looking for new books to read, want some great writing tips from authors or simply have some laughs watching funny challenges then Adrian Beck’s Author Hangout is for you! 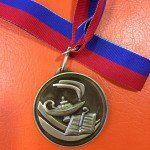 Adrian will add his Author Hangouts to his website so visit regularly. Heath and Adrian began by explaining how they made the book. Adrian’s ideas came from visiting the animals at the zoo with his daughters and that got his imagination going. 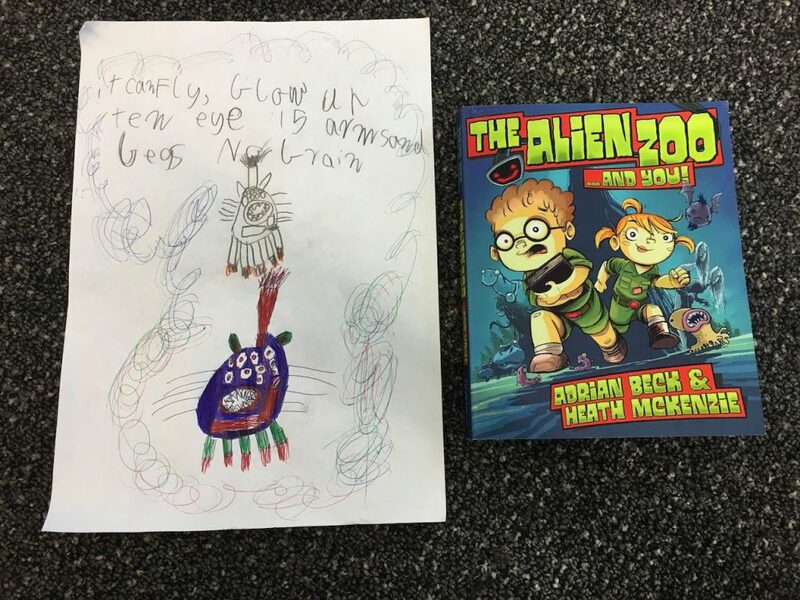 Heath explained that he does a rough sketch of an alien and then a good copy over the top and then adds the details and colour. He drew an alien from the book and used three of the kids in the workshop as a ‘human easel’. 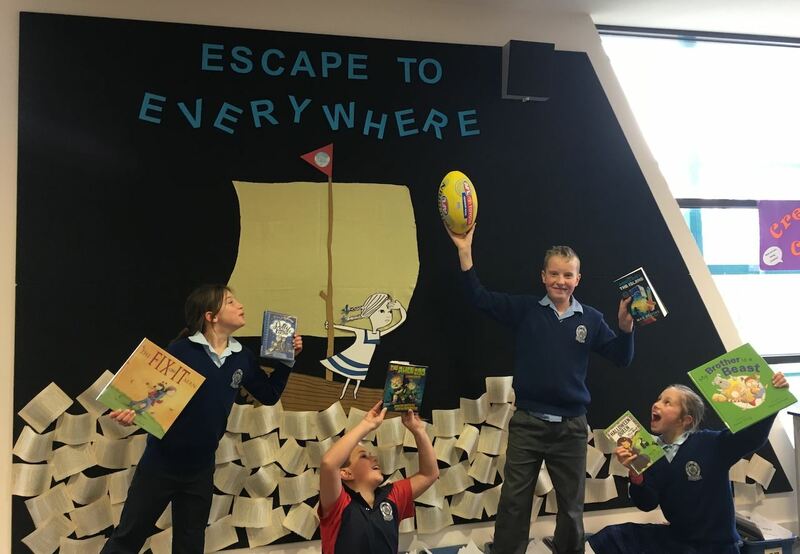 We also had fun acting out being aliens from the book using objects from a basket. I had to be a flurp alien from Mars and they communicate with burps. Heath and Adrian mixed up ingredients to make a mixture that would make me do flurp burps. They added coca cola, milk, pepper, tuna, mayonnaise and ice magic – gross! Luckily I didn’t have to drink it because Adrian and Heath played a game of ‘Paper, Scissors, Rock’ to decide who the loser would be and that person had to drink the mixture…Adrian lost! Adrian and Heath brainstormed ideas to create aliens with us and we used those ideas to create our own aliens. This is the alien I created. Thank you Adrian and Heath for so much fun and thank you Heath for not making me drink the flurp burp mixture! 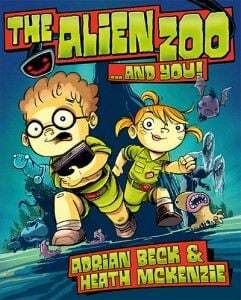 It’s an exciting time for our author friend Adrian Beck who has a written a new series called The Alien Zoo and the first book is ready to hit book shops from this Saturday, July 1st…perfect for reading over the holidays! The sign on the enclosure wall read: Greepers. But it should have said: Heaps Of Greepers. Funny, mysterious and a little bit rude, hold on to your hippos and look inside The Alien Zoo! 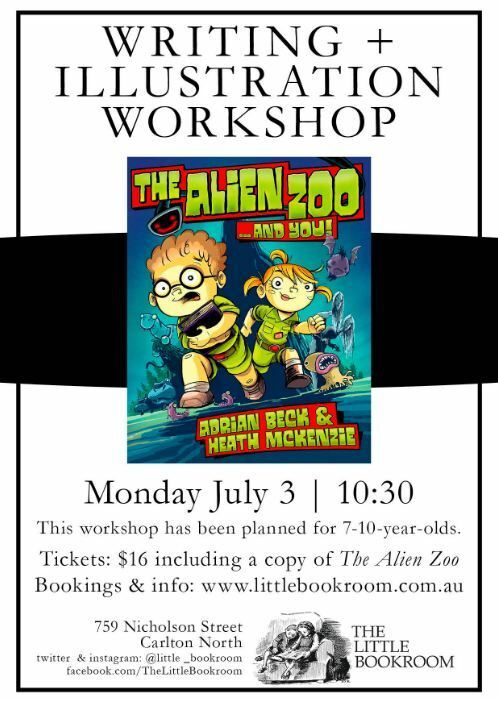 The Alien Zoo was inspired by Adrian’s visits to the regular zoo with his daughters. 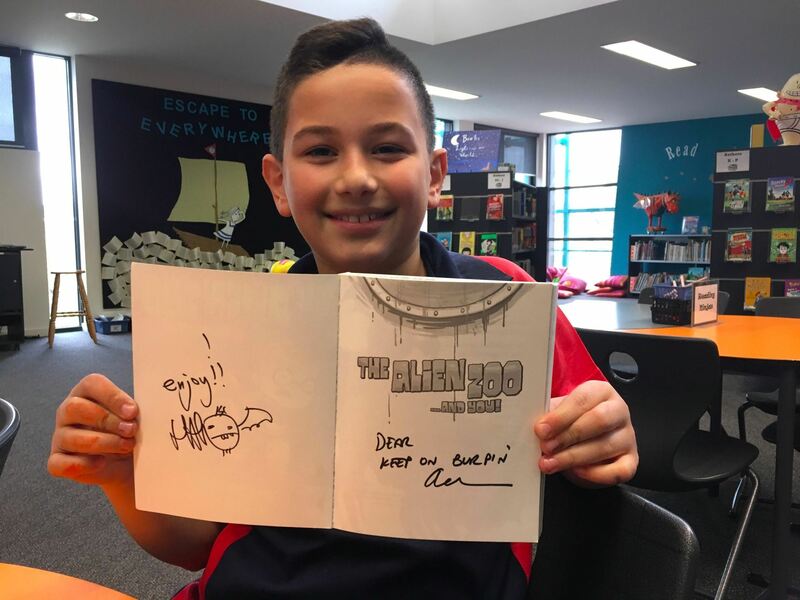 Adrian and illustrator, Heath Mckenzie have played with their crazy ideas to make a book that is funny, creative and it’s interactive too…how cool is that! Here are Adrian and Heath earlier in the year working on the finishing touches of the The Alien Zoo with their editor….important to get that spelling correct, Adrian! If you have a question for Adrian about The Alien Zoo you can write it in the comment section. 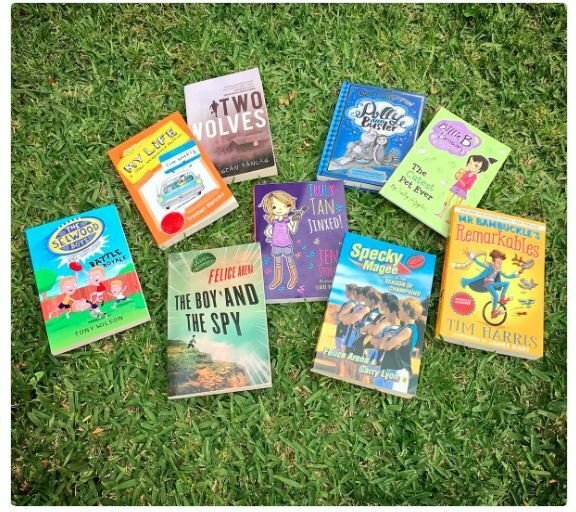 Adrian and Heath are holding a Writing and Illustrating Workshop during the holidays on Monday, July 3rd at The Little Bookroom. 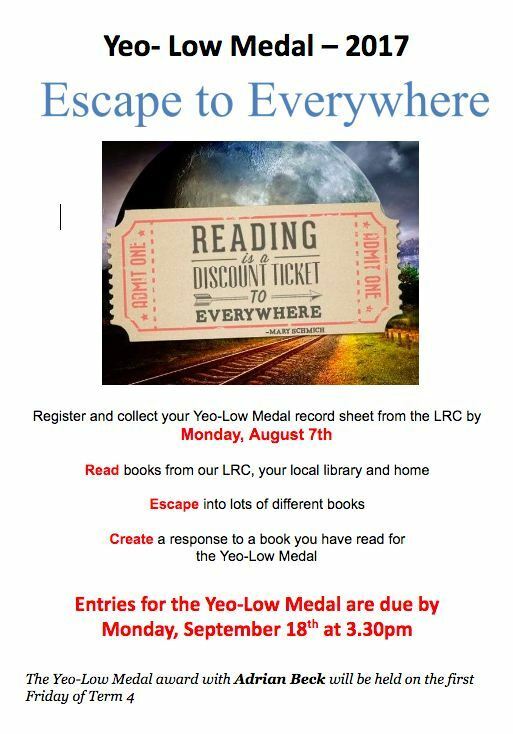 Click HERE for more information and to BOOK your spot!